Hall of the Mountain King: Review: Anthrax, "We've Come For You All"
In the years since their last album, the members of Anthrax have seen their band name become a household word. Unfortunately for them, the word is usually spoken in fear, rather than out of respect for their music. In the wake of the Sept. 11, 2001, terrorist attacks, the threat of biological attack with anthrax bacteria became very real. The band members went through a period of questioning and anger, even briefly considering changing their name. In the end, they decided to remain Anthrax and take all of those frustrations out on their latest album, "We've Come for You All." The record, released earlier this month, is fully locked into the groove the band has gained since vocalist John Bush came on board in the 1990s. The bashing and speedy riffs in songs like "What Doesn't Die" and "Nobody Knows Anything," may take fans back to the 1980s thrash sound, but those tunes are the exception rather than the rule on this album. 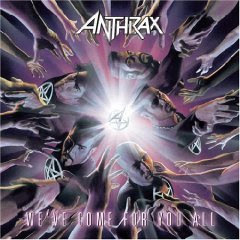 Far more than any other album, "WCFYA" showcases Anthrax's influences. Shades of AC/DC come through in the chorus of "Strap It On," an ode to old school metal. Who vocalist Roger Daltrey guests on "Taking the Music Back." "Cadillac Rock Box," featuring Pantera/Damageplan guitarist Dime, is aptly described by drummer Charlie Benante as "Lynyrd Skynyrd meets 1976-1977 Kiss." Throw a touch of ZZ Top in, and you've got the sound of one of the tastiest morsels of feel-good hard rock I've heard in a while. But it's not just the bands that came before them that influence this album. The insane frenzy of the pre-chorus in "Black Dahlia" even calls to mind their contemporaries, Slayer. Fans may miss the tongue-in-cheek humor of the past that's lacking on this album, but that's to be expected considering the turmoil the songs grew out of. What it lacks in the fun factor, the album more than makes up for in raw power. Ultimately, guitarist Scott Ian gives the bottom line on the album - "It sounds like Anthrax." Indeed it does, but not the thrash-happy Anthrax of the 1980s, nor even the grunge-tainted sound of early '90s Anthrax. Instead it sounds like a growing and evolving organism - a band that remains loyal to its roots, yet at the same time, isn't afraid to try a new approach here and there. Get "We've Come For You All."